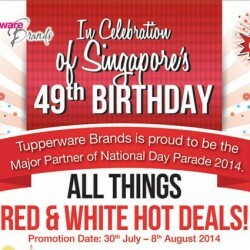 Tupperware has got some great offers in celebration of National Day 2014. The exclusive promotion featuring the best-selling items are valid until 8th August 2014 just for Singapore's 49th Birthday. Find $4.90 or $49 discount on red and white products such as food containers, water bottles, rice dispenser set that comes with a rather interesting microwaveable rice cooker container.